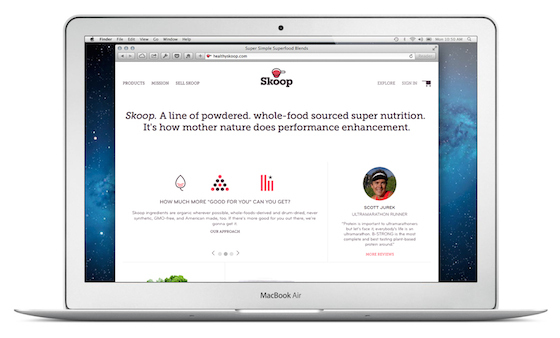 Skoop is a company that makes powdered, whole-foods-derived phytonutrient blends. They’re truly incredible products and recently, they found away to get incredibler. Thanks to a partnership with Salad Bars 2 Schools, a non-profit that provides public school lunch programs with fresh fruits and veggies, Skoop is perhaps the first 1-for-1 nutritional company. Each serving of Skoop sold means a serving of free fresh fruits and veggies is donated to a public school system in this country. Each bag sold, means 30 servings donated. At a time when school lunch programs count things like ketchup, pizza sauce, and french fries as a legitimate vegetable serving, this mission is crucial to our nation’s health. To introduce the new mission, Skoop launched a completely new website that also showcases their unique “crowd selling” model and fundraising functionality. And they created some fun content to spread the word about Skoop products, too. I’m very happy and proud to have partnered with Human Design, The Lot, and my good friends at Skoop, on this effort. It’s exactly the kind of work I wanted Daughters & Howard to be involved with. Expect amazing things to happen.